Diana L. Lang of Vallejo, CA is the author of the poetry books Tea & Sprockets, Abundant Sparks & Personal Archeology, Look Ma! No Hands!, Poet Loiterer, Id Biscuits and the now out-of-print Your Poetry eBook: Quick & Easy Formatting for Kindle. In 2015, she recorded her first spoken word album Happy Accidents. Lang has a diverse artistic background and is also known for her work on the films The Hebrew Project and Liquid Wind. She can be found behind the mic of poetry shows in and around Solano County, California. She has had her poem “Prayer for the Shomerim” published in the Jewish Journal of Los Angeles. 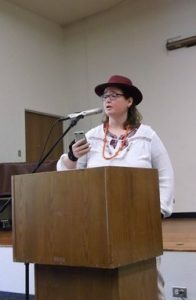 She has won several poetry awards at County Fairs, including Best of Show for the poem “To Get Free” in 2015 at the Solano County Fair. Lang grew up in the American South in Texas, Louisiana, and mostly Enid, Oklahoma, before moving out to the Bay Area. All of these places continue to inspire autobiographical and historical poetry. I most often get inspired to write poetry by taking long hikes out in the country, attending a protest for a cause that I believe in, spiritual moments with my synagogue community, or when I get to be in the presence of other artistic souls. Also, I get inspired while listening to music, especially that of Dan Nichols and Ringo Starr. Over the years I’ve gone from ink pen in a notebook or any scrap of paper available to just dictating my words into the notes app on my iPod. I write wherever I happen to be. Usually, once I get an idea things flow quite stream of consciousness and there’s little planning, but I do go back and edit prior to publishing. Since I’m a poet, this is mainly advice for poets. Go out and read your work to other people when you aren’t writing. It’s good to be in the presence of other artists and writers. Also, get in the habit of writing down ideas as soon as they come to you, no matter how silly. Figure out the things that inspire you and find a way to do them often as a kickstart to your inner writer. For me it can be anything from laying around listening to music while thinking and daydreaming or going on a drive or hike out away from the modern world. Also put your poems as art on Instagram as a way of promotion, because there’s nothing like all those likes flooding in from other writers. I self-publish because it allows me creative control, and because I can go back and add things easily. I’m absolutely unopposed to having a contract, but given that I’m a very prolific poet, my five books would have never been released if I had to rely on someone else. I use createspace to publish my works. While I have had ebooks in the past, I’ve unpublished them only because I’m not happy with the quality of poetry in the ebook format when it’s automatically produced, and I haven’t the stamina to fix it myself. I guess that’s ironic since I wrote a book on how to format poems for it! Books will never go away. They’ll just expand into other formats. Also, poetry is not dead. It merely shows up as memes, inspirational videos, and songs more often these days.